collar, or more accurately, the egg mass of a moon snail. "Moon snail" is the common name for a family of gastropods known as Naticidae. The snail uses sand and it's own mucus to make these collars, which consist of two layers. The eggs are between the layers. It's pretty sturdy until the babies start to hatch; then, it just disintegrates. 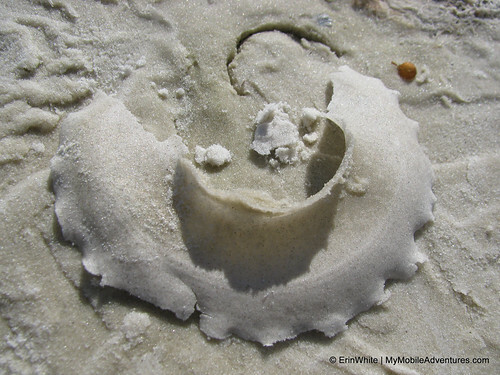 This means that no one should really have a sand collar in their beach-combing collection, for if it's intact, that means it was still carrying babies. If you find one, by all means examine it, but then leave it where it is so the eggs can hatch.